WITH COURAGE AND HEART, YOU CAN BE SUCCESSFUL! Everyone wants to be successful—and surely you are no exception. After the massive success of Jack Canfield's The Success Principles, thousands of requests came rushing in to develop the most important success strategies for today's teenagers. Your calls have been answered. Jack Canfield, cocreator of the famed Chicken Soup for the Soul series, has teamed up with successful author and young entrepreneur Kent Healy to design a fun and engaging book that offers the timeless information and inspiration to help you get to where you want to be. 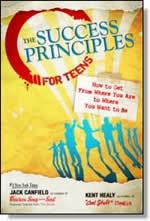 The Success Principles for Teens is your road map whether your goal is to become a better student or athlete, start a business, make millions of dollars, or simply find guidance and direction. The principles in this book always work, if you work the principles. This is not merely a collection of 'good ideas.' This book includes 23 of the most important success strategies used by thousands of exceptional young people throughout history. With the right tools, anyone can be successful. This book will give you the courage and the heart to get started and get ahead. wind, but you can change yourself. It's going around like a bad flu. It's infecting innocent people and restricting their potential. What is it? The shocking myth that we are simply entitled to a great life. How could this happen? Well, many of us today believe that somehow, somewhere, someone (certainly not us) is responsible for filling our lives with continual happiness, exciting career options, entertainment, money, amazing friendships, and relation­ships because . . . well . . . we exist. Isn't that enough? We wish! If you want to be successful, retire early, gain the respect of others, and just have more fun, then you need to take 100% responsibility for everything that you do and experience in life. This includes the level of your achievements, the quality of your relationships, your emotions, the results you produce in and out of school, and the state of your health—yes, everything! But let's get one thing straight: This is not always easy. In fact, most of us have been conditioned to blame something outside ourselves for the parts of our life that we don't like. We blame our parents, teachers, friends, MTV, the weather, or even the star-sign forecasts! It's crazy! Most of the time we don't even know we're doing it. The truth is, the real problems or challenges we face usually have little to do with our 'outside world.' We're often scared to look at the source of it all . . . ourselves. Sure, we will all experience our own unique challenges that happen out of our control, but taking responsibility means that we don't dwell on the problem, ignore it, complain about it, or blame someone or something else for what we're experiencing. Instead, it means that we take control of our thoughts and our actions, and do whatever we can to improve the situation. Sure, life's challenges come in all shapes and sizes, but there is always something that we can do differently to change what we are currently experiencing. And we must first believe this before we will find any new solutions. Whether someone is super-successful or struggling to survive, the quality of their life depends on their thoughts, actions, and beliefs. Do you notice a trend here? These three things all have to do with the individual—not the teacher, the weather, or outside circumstances. The truth is, success starts with one person . . .
Nathan, 18 (Indianapolis, IN): I didn't meet Jack Canfield under the best circumstances, but looking back, I'm glad we crossed paths. Jack was at my school working with a group of teachers when he heard me arguing with one of my teachers outside the staff room. He left his meeting, walked over to me, and asked me to explain the situation. I told him (in a loud voice) that I had just been suspended from the baseball team and that this wasn't fair. They couldn't do this to me. Not now! 'What's not fair? And why not now?' asked Jack. 'When I was in grade school,' I told him. 'Okay, so why are you standing there pretending to act like you don't know that school is not fair? Every teacher has a different set of rules. Some teachers enforce some rules and not others. Sometimes good kids get bad breaks, and kids who don't play by the rules get away with breaking them. Isn't that true?' asked Jack. 'Three times,' my principal said. As you can imagine, this made me angry. He continued, 'You made something else more important than getting to school on time so you could play baseball. 'I don't know. You tell me,' Jack responded. We talked for a little longer, and then Jack convinced my principal to give me one more shot now that I was more aware the situation and was accepting full responsibility. But, we all agreed, if I was late one more time, I would be suspended with no rights to complain or fight about it. There was one last problem to solve. I needed a new strategy to make sure I would get up on time. Hitting the snooze couldn't be an option. We brainstormed and came up with several strategies. First, I had to put my clock on the other side of the room so I would have to get out of bed to turn it off. And, second, if I wasn't up by a certain time, I had to pay my mom a dollar to pour ice water on me. I knew my mom would be very happy to do that! I was not late anymore. Jack helped me realize what it really meant to take 100% responsibility. The rest of my baseball season went well—even my coach commented on my change of attitude. Now, I'm attending college on a baseball scholarship. It's a good feeling to know that I was able to take control and make it happen. Night has fallen, and the city has become dark. A man is on his hands and knees searching for something under a streetlamp when a young woman passing by asks the man what he is doing. He explains that he lost a key and is desperately looking for it. The young woman offers to help him search for the key. This is a great example of how we look outside of ourselves for the solution to our problems because it's easier than searching for the real cause, which is inside us. We are the source of our problems, and we need to face that fact because until we do, we can't change anything. We need to look life straight in the eyes and face the facts—no matter how uncomfortable it may be. Of course, we all want things to get 'better,' but it simply won't happen if we refuse to see things as they are right now. Change can only begin once we acknow­ledge that there is something we need to change. You might be happy with the way things are in your life—and that's fantastic—but every successful person knows there is always room for improvement. The very first step to achieving major success and enjoying the things that are most important to you is to take 100% responsibility for your life. Anything short of that won't get you what you really want. 1. 4 Excuses or Excellence? come from people who have a habit of making excuses. Like opposite forces of a magnet, success and excuses just refuse to work together. They simply cannot co-exist. Taking responsibility means more than just taking initiative and owning up to mistakes. It also requires that we stop making excuses. As long as there are excuses, there will be no positive results. Think about it: Every excuse is like pushing the ejection button on an airplane. The minute you push it, you've committed to exit the plane. In that instant you're heading in a completely new direction, leaving the opportunity for success behind. Excuses allow us to give up mentally and justify why something can't be done or why we're not good enough—and once that happens . . . game over. Kent: Truly successful people know that even the best excuses don't help anything. It doesn't even matter if the excuses are truthful and accurate. A few years ago, my brother and I learned this lesson the hard way while we were writing our first book. When we started the project, we were in school, playing sports, working, and trying to write the book as well. There were many times we barely had enough energy or time to finish our homework, let alone work on our book. It was almost as though people expected to hear this response. They listened to our explanation (which was really an excuse) and responded with a simple, 'Huh, okay.' That was it. Nothing more. The truth was, we really were tired, and we were short on time, but believing that we couldn't do anything to change the circumstances meant we weren't really taking full responsibility. Taking 100% responsibility means that we are committed to finding a solution to the challenges we face. Here's what we learned: No matter how truthful your excuses are, people don't want to hear them. All excuses do is slow us down, and nobody benefits from them. The only way my brother and I were able to finish our book was when we stopped making excuses, stopped complaining, and just got to work. So, what's step number one? Believing that we have the power to make things better and produce the results we really want. We all make excuses for different reasons, but it really doesn't matter what those reasons are. All that matters is that from this point forward we choose—that's right, it's a choice—to act as if we are 100% responsible for everything that does or doesn't happen to us. In short, YOU must decide to be in control. A lot of people roll their eyes when they hear the word 'responsibility.' They say, 'Yeah, yeah, yeah . . . I've heard all of that before!' (And, yes, we were two of 'those people.') But there is a big difference between 'knowing' about something and 'acting' on something. Jack: When I wrote the original The Success Principles book, taking responsibility was also the very first principle—and that book was designed for adults! Sometimes we just need to be reminded of what we already know so we can put the ideas into practice. it will not change you. Question: What are the two easiest things to do when we don't get the results we want? How do we know this? Because we've been guilty of both these things. Believe us, we know how easy this is. Anyone bold enough to admit it would also say that they, too, have fallen into this trap. But just because it's easy doesn't mean it's right. Let's take a look at the first trap: blaming. Taking responsibility means that you don't blame other people or things outside of yourself. If you think about it, blaming is really just another form of excuse-making. It's a way for us to come up with a reason why we didn't perform. And, you guessed it, all it does is slow us down. Blair, age 22 (Salt Lake City, UT): I wanted good grades; I wanted to be MVP on my volleyball team; and I wanted to be fit and healthy . . . but I guess that wasn't enough. My intentions were good, but achieving all of this was a much bigger commitment than I thought. When I didn't get the grade I hoped for or I didn't make a good serve on the volleyball court, I immediately looked for things that other people weren't doing right. I refused to admit that I was probably the cause. I blamed my teachers for not teaching well enough. I blamed my teammates for not trying hard enough. And I blamed my piles of homework for the reason I ­couldn't exercise enough. This made me feel good in the moment because, after all, 'It wasn't my fault.' Nothing was my fault . . . and that's where I ran into trouble. Wow! I was taken by surprise. I never looked at the situation like that before. I noticed that the reason I never achieved my goals was because I was letting the world walk all over me. I realized that I do have the power to change things. I'm now twenty-two, and I have accomplished more of my goals in the last year than in the previous twenty-one years of my life. For me, the power of responsibility was life-changing. TIP: Instead of pointing the finger at other people, use it to identify a new solution. Now let's look at trap number two: complaining. the ball bounces is likely the one who dropped it. Blaming and complaining work really well together . . . too well. Sure, we can blame our problems on someone else or something else and complain all we want. We certainly aren't going to stop you—and it's likely that no one else will either. But if you do this, realize you're only hurting yourself because life will move on . . . with or without you. There's another way to look at complaining that most people don't think about. Consider this: In order to complain about something or someone, you have to believe that something better exists. Hmmm . . . In order to complain, part of you must believe that something can change for the better. You need to have a reference point of something you prefer, something that you don't yet have. Look at it this way: People usually complain about things they can actually do something about. We don't complain about the things we have no power over. Have you ever heard anyone complain about gravity? No way! Here's the raw truth: The circumstances we do complain about are, in actuality, situations that we have the power to change—but have chosen not to. We can always study more, eat healthier, change classes, work out harder, practice longer, choose better friends, and feed our minds different information. Yes, we do have that control. Now, you might be thinking, 'Well, Kent and Jack, if it's that simple, then why don't more people have what they really want?' Good question! The answer is that these actions require change, and they also involve risk. For most people, the risk of losing friends, being alone, or being critically judged by other people is much scarier than sitting back and just 'letting life happen' to them. 1) -Accept that you are making the choice to stay where you are and stop complaining. 2) -Step up to the challenge and take the risk of creating your life exactly the way you want it. To get from where you are to where you want to be, you're going to have to take some risks. That's just part of life. If it's you who got you to where you are now, it's also you who can get you to where you want to be. If you truly understand this law of life, you will have complete control of your ­destiny. The basic idea is this: Every outcome we experience in life (whether it's success or failure, health or illness, happiness or frustration) is the result of how we have responded to an earlier event (or events) in our lives. 1) You can blame the event (E) for your lack of results (O). In other words, you can blame your parents, your teachers, your friends, your teammates, your childhood, the weather, racism, your lack of support, and so on. But how useful is the 'blame game'? Sure, these factors do exist, but if they were the deciding factors, nobody would ever succeed. - Michael Jordan would have never made it to the NBA. Helen Keller wouldn't have been able to inspire millions of people. Martin Luther King Jr. would never have influenced our entire nation. Oprah Winfrey wouldn't have had the country's top daily talk show, Bill Gates would never have founded Microsoft. Need more? The list goes on . . .
- Lots of people have overcome these so-called 'limiting factors'—so it can't be these factors that limit you. It's not the external conditions or other people that stops us—it's us! We stop ourselves. We think limiting thoughts, defend our self-destructive behavior, ignore useful feedback, waste time on gossip­ing, eat unhealthy food, fail to exercise, spend more money than we make, don't plan for the future, avoid risk, and fail to tell the truth—and then wonder why our lives don't work. As you know, this option is not beneficial. 2) You can instead simply change your responses (R) to the events (E)—the way things are—until you get the outcomes (O) you want. This is the option that creates wealth, opportunity, freedom, and so much more. At any given moment, we can change our thoughts, change the way we look at ourselves, and change our behavior—that's the power of YOU. And that's all we need to control anyway. If you don't like your outcomes, change your responses. Unfortunately, for many people these factors are controlled by old habits. We tend to react without thinking things through. How­ever, the moment we take re­sponsibility and commit to making a change, we can take back that control. It's not some­thing that happens over­night, but catching ourselves in the middle of a negative thought and changing our behavior just a couple of times each day can make all the difference. In the end, it's not what happens to us; it's how we respond that matters. And how we respond is completely up to us. Immediately following the announcement, I heard an uproar from the students—moaning, groaning, and complaining. I'll admit it . . . I wasn't very happy to hear about an exam either. As I made my way to the gym and waited in line, I could hear students complaining and see them bickering with each other. Then I noticed a different group of three or four people who appeared to be unaffected by this surprise exam. They were smiling at each other and laughing, and I wondered why. I walked over to them and listened to what they were saying. 'What do you think is going to be on the test?' one girl asked. Her friend replied, 'If it's multiple choice, I can do it with no sweat.' 'Yeah, I'm not worried about it either. I've been doing all my classwork. Besides, since I don't know what the test is on, there is nothing I can do right now to prepare for it, so there is no point in stressing about it. Right?' She laughed. Then I saw someone else who was listening to his iPod as he read a book. I remember thinking to myself, 'Hmmm, if the test was really the determining factor to the way people felt, then everyone should be upset.' But not everyone was. It depended on one thing: their response. It was each individual's response (R) to the exam that gave each person his or her own unique outcome (O). It was a combination of attitude and behavior that created their completely different experiences.